Review: Readers expecting a memoir of Tina Fey's life will be disappointed with 'BossyPants.' While thoroughly sarcastic, it reads more like a collection of essays. Fey recounts memories from her life but reveals very little personal information about herself. I believe she has an older sibling who is maybe mentioned once. The best chapter is a section on her father (Don Fey), but her mother is barely mentioned at all. While we hear a funny story about her honeymoon, readers have no idea how she met her husband or fell in love. If you are a fan of 30 Rock, Tina Fey is Liz Lemon (with a husband and baby). She did provide some details behind the scenes in the television industry which were interesting. Overall, it was an okay read. 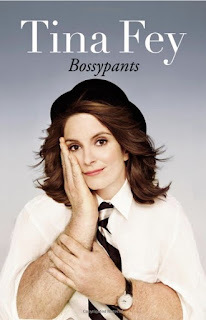 I never laughed out loud nor feel like I learned too much about Tina Fey. I would be interested in reading a book about her father, he seems like one cool cat. I wouldn't recommend this to anyone (however, I recommend 'Sh*t My Dad Says' to almost everyone I know), but if you want to read it, borrow it from the library or a friend. It's not worth the hardcover price.